What a pity, I was considering buying from them. The only other source of rhodium bars I found is a British company, Baird & co.
Kitco also sells their bars. However, Kitco says "The bar(s) you receive may not be in mint condition." I wonder if they also may be broken, like the bars from Cohen. If you find a supplier that accepts credit cards and ships outside of USA please post something on the site about it. Hey, thanks for the comment. Does it really say that they might not be in mint condition? I know rhodium is brittle and hard to work with. If that's the case, then I'm not as upset. Still I would rather learn that from the person I gave $1000s to instead of someone else on the Internet. I won't buy from them again. No thanks! The Kitco link in the other post mentions it in the bottom of the page. To be sure about what the damage is, you only would know for sure asking them via email. I never bought anything from them because their minimum order of 2500USD would be difficult to handle from my country, lots and lots of paperwork would be required. And to add insult to the injury, they only ship their 10 troy ounces bottles of rhodium outside of the United States. Kitco buys back rhodium, the sponge (powder) bottles that they sell. If they also buy back the bars, they would probably be made back into powder, to be assailed and repackaged. They pay less for their bottles when the seal is broken; bars coming from who-knows-where, if they accept them, would fall in the same case. I forgot to mention that in my opinion the need to check the authencity of the bars would make unlikely that they resell previously owned bars. Hence, all damage on them would be from the mint. I bought a 1oz rhodium bar from Baird & Co. and it had surface scratches but wasn't damaged in any other way. The sphoto on their website shows an unmarked bar. This may be what Kitco are referring to. Rhodium is such a difficult metal to fabricate that it can't be polished to a flawless finish like traditional precious metals. The bar I bought came in a sealed holder - Baird said they will buy back the bars provided the seal hasn't been tampered with. That said, the spread on rhodium is much wider than for gold, platinum etc., so the price has to go up that much more to realise a profit (sadly my bar has fallen £160, ~$255 in the three months since I bought it). I've bought 7 ounces of Baird, 5 purchases, from Golden Eagle Coins. Paid by check each time, delivery within a month. Price has bounced up for second time in last two months, so lows may be in or close. 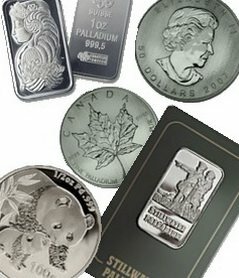 I'll keep buying 1-2 oz at a time, average down or up under $1,500.